*New customers only. Registration required. Min £10 deposit. £30 bonus includes £10 slots bonus which must be wagered x30 before withdrawal and £20 bingo bonus which must be wagered x3 before withdrawal.Free Spins must be used on Batman and Catwoman Cash Games and all winnings must be wagered 30x before bonus converts to cash. Bonus expires 7 days after receipt if not used entirely.T&Cs apply. Established in January 2006, Sun Bingo is a firm favourite amongst regular bingo players. When they switched from Gamesys to Virtue Fusion in 2016 it was a great change as it means you can now play top games such as Cash Cubes, Deal or No Deal and Rainbow Riches Bingo. Slots players will also find a range of great, quality games and scratchcards to play. Regular promotions mean that players get a lot of value from this site and there is always something new to try. Plus more great games, big jackpots and promotions - see below for more information!! 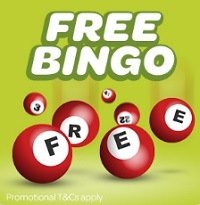 We at BestBingoWebsites love Free Bingo. It's a great chance to play and not actually care whether you lose or win. Of course a win is always welcomed! Head over to the Breakfast Club 8 - 9am and the Jazz Room 8-10pm every Tuesday and Thursday for FREE Bingo. 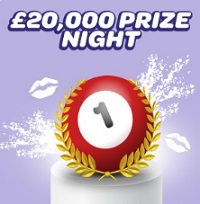 All prizes are paid as cash so your winnings head straight to your pocket. Everybody's favourite Rainbow Riches Bingo is available at Sun Bingo and every second Friday of each month there is an enhanced schedule with a £10K prize pot. 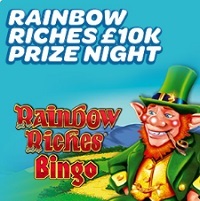 Follow the road to riches in order to grab the £10K pot at the end of the rainbow. That Leprechaun knows you want his Lucky Charms though so watch out! Between 5pm and midnight there are two extra Rainbow Clovers, two Bingo Prizes, a Jackpot Prize and a Feature Prize! In addition to the standard prizes, you can also play towards winning one of the Rainbow Riches Jackpot prizes and the Wishing Well Feature prize! Another huge prize night. We are a big fan of these as nothing beats a big win! This time, the party takes place on the first Friday of each month between 6pm and midnight in the Glamour Room. Don't miss the Bingo Linx game at 9.30pm! 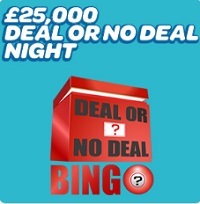 From 4pm to Midnight in the Deal or No Deal 90 Ball Room this enhanced schedule will see £25,000 given in prizes. Tickets cost from 15p to 50p so you won't want to miss your chance to take on the banker. The Android and Apple mobile apps mean game play on the go is straightforward enjoyment. Simply go to Sun Bingo, click Download Mobile App at the bottom of the homepage, and follow the step by step instructions provided! Best of British at Sun Bingo!